Throughout the Membership Directory you will notice that some of the Elite Members who are listed have a membership Badge denoting that they are Master Trainers. You might like to know our definition of a Master Trainer or you may even be interested in requesting a Master Trainer badge for your own listing. There are numerous training providers throughout the globe offering training in Cosmetic Tattooing both to new trainees and to experience Cosmetic Tattooists, there is a much smaller group of trainers who provide unique and innovative training services with a focus on excellence both in client services and training services. 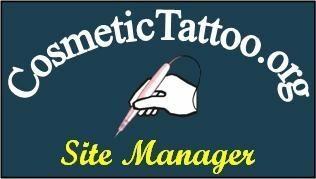 CosmeticTattoo.org has defined strict criteria for the award of a Master trainer badge with the intent that the entire Membership base can have confidence that the trainer is a person of eminence and their services represent the best that the industry has to offer. The trainer has broad industry experience across all areas of Cosmetic Tattooing. The trainer has developed new procedural techniques that have provided significant innovation and enhanced client/patient outcomes. The trainer is an expert user of advanced contemporary Cosmetic Tattoo equipment, in particular the use of high end digital equipment. The trainer in an expert in the use of the full range of contemporary needle configurations. The trainer has developed their own training courses and the courses have provided significant innovation either via mode of delivery, training techniques, or enhanced training outcomes. The trainer offers training and promotes services at clinical procedural standards. The trainer’s services routinely encompass Cosmetic Tattoo services to clients, Medical/ParaMedical Tattoo services to patients as well as training services in all service areas. The trainer has provided training to experienced cosmetic tattooists at an advanced level. The trainer has been formally recognised by the wider industry as a trainer of significant International standing. The trainer has provided training at or presented at a significant international event. The trainer can demonstrate they have made a significant contribution to the industry. The trainer demonstrates the highest ethical principles in their client services and training services. The trainer is held in high regard by their client base. The trainer has a current Elite Membership Directory listing and or is an active member of our Education Team. If you believe that you meet our criteria for a master trainer you can request that a Master Trainer Badge is added to your Membership Directory Listing. There is no additional charge to be awarded a status badge they are awarded on merit alone. You can make an application for Master Trainer Badge by clicking this link. Copyright © 2012 CosmeticTattoo.org All Rights Reserved. No copying, transmission or reproduction of site content is permitted without our prior written consent.